Macdonald processes are probability measures on sequences of partitions defined in terms of nonnegative specializations of the Macdonald symmetric functions and two Macdonald parameters \(q,t \in [0,1)\). We prove several results about these processes, which include the following. (1) We explicitly evaluate expectations of a rich family of observables for these processes. (2) In the case \(t=0\), we find a Fredholm determinant formula for a \(q\)-Laplace transform of the distribution of the last part of the Macdonald-random partition. (3) We introduce Markov dynamics that preserve the class of Macdonald processes and lead to new “integrable” 2d and 1d interacting particle systems. (4) In a large time limit transition, and as \(q\) goes to 1, the particles of these systems crystallize on a lattice, and fluctuations around the lattice converge to O’Connell’s Whittaker process that describe semi-discrete Brownian directed polymers. (5) This yields a Fredholm determinant for the Laplace transform of the polymer partition function, and taking its asymptotics we prove KPZ universality for the polymer (free energy fluctuation exponent \(1/3\) and Tracy-Widom GUE limit law). (6) Under intermediate disorder scaling, we recover the Laplace transform of the solution of the KPZ equation with narrow wedge initial data. (7) We provide contour integral formulas for a wide array of polymer moments. (8) This results in a new ansatz for solving quantum many body systems such as the delta Bose gas. The authors would like to thank P.L. 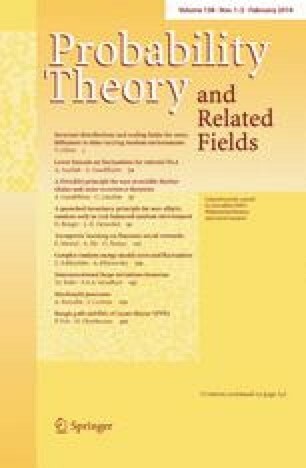 Ferrari, V. Gorin, A. Okounkov, G. Olshanski, J. Quastel, E. Rains, T. Sasamoto, T. Seppäläinen and H. Spohn for helpful discussions pertaining to this paper. We are particularly grateful to N. O’Connell for generously sharing his insights on this subject with us through this project. Additional thanks go out to the participants of the American Institute of Mathematics workshop on the “Kardar-Parisi-Zhang equation and universality class” where AB first spoke on these results. AB was partially supported by the NSF grant DMS-1056390. IC recognizes support and travel funding from the NSF through the PIRE grant OISE-07-30136 and grant DMS-1208998; as well as support from the Clay Mathematics Institute through a Clay Research Fellowship and Microsoft Research through the Schramm Memorial Fellowship.